Four months ago when FTD decided it was time to transition the wild-child from his crib to a toddler bed, I knew it was a bad idea, and I was right. Normally, I would be gloating all over the place about being right, but I can't because I am too tired. Four months ago also happens to be the last time I had a good night sleep, thanks to a toddler sleeping on my head or handing out choke hold hugs, headbutts, and round house kicks, ALL NIGHT LONG! Clearly, the crib to toddler bed transition was a complete epic fail in my house. If I could do it all over again, I would leave Ollie in his crib until he was too big for it, then buy him a full size bed to make the transition. As those of you know who have been following me on my ridiculous adventure of transitions and sleep training, the only person to sleep in the toddler bed is ME! After a few nights of constantly being head butted, kicked, poked and slept on, I take refuge in the toddler bed. It's OK, laugh at me. "How come you get to sleep in the same bed with daddy, and I have to sleep by myself? I don't want to sleep by myself." Well... son... because... um... because I said so? Because everyone sleeps better that way? Ugh... I get it. I suppose if I was a toddler, I would be pissed too if I had to sleep in my room by myself. It must seem really crappy that mommy and daddy get to share a bed. Still, every night when he comes into my bed I carry him back to his bed until either I can't stand it anymore, or it's past 5am and I know if I take him back, he will stay up. This happens, every night. I've had it with the constant sleep battles. For over two years I managed to keep Ollie out of my bed, and in what seems like overnight, now I can't get him out of my bed! After complaining to anyone who'll listen, I have come to the conclusion that I'm not alone; most everyone has a child in their bed by morning. I've decided the only way to really get a good night sleep, is to get a bed that fits everyone comfortably. Forget, can't beat 'em, join 'em, It's, can't beat 'em, buy a bed big enough to fit 'em! 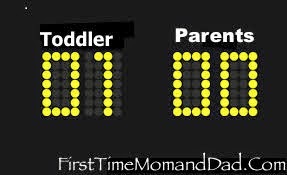 And so there you have it, the toddler has finally won. Rather than up-size the toddler bed to a full bed, FTD and I are going to spring for a King instead! 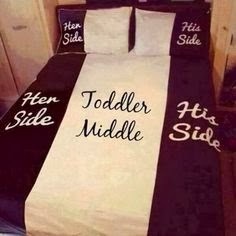 Please share your story of how your transition from crib to toddler bed is going, and how old your toddler is/was when the time came to make the transition.